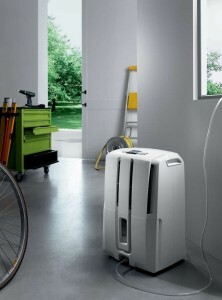 Delonghi - DD50P : Dehumidifier Review • The Air Geeks, reviews of air conditioners, dehumidifiers and air purifiers. When moisture becomes a problem, the first thing many people do is buy a dehumidifier while they work on finding a permanent solution. The market offers a wide selection of dehumidifiers to satisfy the needs of anyone looking to reduce the moisture in their homes. If you would like a high-performance device with innovative and useful features, then you should take a look at the Delonghi DD 50P. We believe it has a great deal to offer. After we provide you with an overview of this powerful device, we think you may also fall under its spell. Unsurprisingly, it really looks like a dehumidifier. It even shows that the water level has raised its reservoir. Despite these functional features, it has a clean and beautiful design that allows you to confidently display it within your home. You may find that the Delonghi DD50P will enhance the decor you have chosen for your interior. It is a powerful dehumidifier. It is capable of capturing 50 liters of moisture per day with an air flow of 360 m3 / hour. Due to its impressive performance, we can say with confidence that it does its job quite well. Moreover, people who have purchased and used this device have only said great things about its performance. This unit can easily clean and remove moisture from your home’s air. If you choose this dehumidifier, you will see significant savings because of its dehumidification capacity. People with very high ceilings are particularly satisfied with its performance. This is a Delonghi device which is well-known in the industry for its reliability and performance. The Delonghi DD50P definitely delivers the results you would expect from such a great brand. You don’t need to worry about device failures and poor performance that you often see in other dehumidifiers on the market. It is very rare for Delonghi devices to fail. The Delonghi DD50P humidistat system will pleasantly surprise you. It includes an electronic humidistat system and allows you to easily view the temperature in a room as well as the humidity of the air. The only problem you may encounter with the device is the noise it makes while in use. While some people find the noise to be unbearable, most people think that its positive qualities still make this a great investment. This device weighs 17kg, which is still quite heavy. The good news is that you can carry it around with you easily, thanks to its transport tires and convenient handle. You can also connect it directly to the exhaust system of your house through a drain pipe. This makes is easy to handle and get started with the system. Having a basement that has a high relative humidity (68%), I wanted a dehumidifier that would not require me to make constant trips to it to empty a bucket. I saw this unit and decided to give it a try. Here is what I liked: 1. The unit is very easy for one person to move around on the floor (rollers) and not too heavy when it arrived in a box to move to where I wanted to put it. Note, this does not mean that it is light! I was just able to move it by myself without much fuss. Once out of the box, there are hand holds to pick the unit up with should you need to do that. 2. The instructions are simple and setup is fast. The only place that the instructions are lacking has to do with using the built in pump. If you try using the unit with just the bucket and then decide to switch to the pump (NOTE: pump hose connects up front at the bottom while gravity drain connects to the back near the upper half of the unit) you might get a pump blinking indicator. The directions only mention that you might not have connected the hose correctly. It should ALSO mention that if the unit has been running prior to doing this, you might need to drain the upper tank first!!! You can do this easily by removing the rubber plug at the top back (connection for the gravity drain) an removing the water. Then, replace the plug and everything works as it should. Please note, you might get some water on the ground doing this so do NOT do it on your carpet!!!! 3. Once set, the unit removes a LOT of water in a short amount of time!!! So, unless this is a one time use, I would suggest either using the gravity drain to a bucket or use the pump. I used the pump to drain to a sink which was 5 feet above the unit and it worked just fine. 4. The unit dims its display after a bit so it is not a bright light that is distracting. It is fairly quiet considering the amount of air it is moving. I use the high fan setting and it does not bother me being in the same room with it. If you were sitting next to it you might want to use the low setting which is very quiet. 5. When the unit reaches the set humidity level, the fan speed drops to low and the compressor does not run until the humidity level again becomes an issue. NOTE: The fan does NOT shut off, just reduces speed to a low level. 6. There is a timer feature that will turn the unit on and off if you should so desire. What I did not like as much: 1. What I did not like as much was that the directions and trouble shooting manual did not mention that if the unit had been running, you need to drain the upper tank first for the pump to work properly (Blinking pump light when it should be steady). They seem to presume that you would not change your mind once you were using it. Other than the one item mentioned above, the unit works great, looks good, is relatively quiet, and removes water like it should from the air. It took my basement (800 sq feet) from 67% humidity to 44% in 9 hours. I would highly recommend this unit if you need a dehumidifier. Keep in mind that the rating for water removal is the maximum amount of water that the unit can remove in 24 hours and is NOT the size of the internal holding tank!!" Good: Removes moisture just fine with a reasonable noise level. Bad: Fan runs continuously regardless of humidity or compressor operation. Water pump is continuous and very uncomfortably loud. (had a Winix WDH851 until buyer wanted it with our house sale - for 3+ years, it flawlessly turned on/off as needed and pumped water only when the bucket was full. Winix is not making dehumidifiers at this time)." 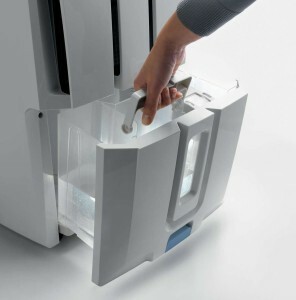 We believe that the dehumidifier Delonghi DD50P is one of the best on the market. It really does what you expect a dehumidifier should do and offers convenient features that make its owner’s life easier. Featuring a sleek design, it is easy to handle, efficient and above all, a truly effective system on surfaces of more than 45 square meters. This dehumidifier is a real ally for those who have moisture problems in their homes. In terms of its price, given all it can do, it is quite reasonable. We recommend it if you want reliability!